carriewriterblog: Film Review: "Rachel Getting Married"
Film Review: "Rachel Getting Married"
If you're going to see a film involving family repression, forced cheerfulness, a drowning, an absentee mother and a tryingtomakeeverything OK dad, you're better off renting "Ordinary People," the seventies classic that delved into family dynamics with a vengeance, and as painful as it was to watch, left the viewer immensely satisfied. Not so for this viewer of "Rachel Getting Married," which left me at the end of the film wondering why seeing Anne Hathaway chain smoke, become confrontational and nasty every time she walked into a room, get into a car accident, and make feeble attempts to rehabilitate herself after years of serious drugs, was not particularly worth it. Weddings have been used in films and in literature for years, as a backdrop to larger issues, as a vehicle to bring people together who normally wouldn't be. Who can forget Carson MuCuller's classic "The Member of the Wedding," or even the hilarious and wildly entertaining film of a few years ago, "My Big Fat Greek Wedding"? With this particular wedding, of Kym's sister Rachel, the situation felt forced, and the Greek chorus of family and friends contrasting the family saga felt shallow and overplayed. Why did none of these people have any lines? Perhaps in an attempt at cinema verite, there are a lot of long scenes of struggling musicians, heated "toasts" that are used to provide backbone to the story, long sequences of reception dances, multicultural acceptances, and moments of great joy contrasted with characters literally fighting it out. While scriptwriter Jenny Lummet has some great dialogue and does get a lot "right," the emotional payoff is not worth sitting through the painful family scenes. The movie places all its emotional "chips," so to speak, on the many scenes between Rachel and Kym, where the characters hug and express love for each other one moment, and then are ready to kill each other the next, as Kym's years of being a hopeless mess have taken their toll on Rachel and the rest of the family--not to mention Kym's dark secret which has caused her and her family to self-destruct. They do a frustrating dance of love and hate, and never seem to particularly get anywhere, which may be true in real life, but in a movie I want something more distilled, or at least a reason to be routing for these characters. People do strange things when they are in distress. They drink too much or take drugs. They try to change the subject, or have a lot of people around. They get into car accidents. They cook food and try and get other people to eat it. They hurt themselves, and usually hurt others. In this movie, it's really all of the above, and by the end we are exhausted without much to show for it. This movie also really made me miss one of my old favorites, "The Big Chill," which always captured for me the true meaning of "you can't go home again, but you sure can try." 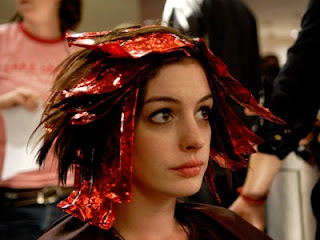 Did I care whether Anne Hathaway ever recovered from her addictions? Not really. Did I care about Rachel getting married? No. Did I want the movie to end a lot sooner then it did? Yes!